After soaking up 72-hours of conversation on the arena among friends, relatives and people posting online, we’ve come to an important conclusion —- A segment of Wisconsin residents, certain pundits and perhaps even a handful of legislators do not understand that the “Jock Tax” is already in place and collecting millions in income tax from pro athletes who perform in the State of Wisconsin. As we highlighted in our piece the other day, Wisconsin has had what is known as a non-resident entertainer tax for decades now. All NBA players who play in Wisconsin pay income tax on a portion of their salary reflective of the number of games they play here. For example, LeBron James has paid Wisconsin State income tax since he first entered the league in 2003. Entertainers such as Jerry Seinfeld also pay this tax when they perform in Milwaukee. When details of the new financing plan leaked out last Wednesday, some pundits were incredulous. We wondered why their objection to the new plan was so much greater for this plan versus the “Pay Their Way” plan announced by Governor Walker back in January. 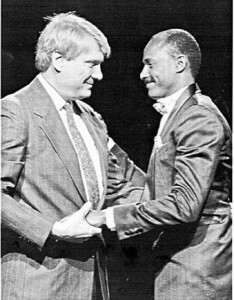 We believe that a number of people were confused by the term “Jock Tax” and simply assumed that with the original plan, the State was going to implement a brand new tax reserved solely for NBA players and that such revenues would be used to pay the debt service on arena bonds. When they heard the new plan, there was an assumption that somehow the NBA players were off the hook and that “Joe Lunchbucket” now would have to pay for everything. The only difference between the old plan and new plan is that the new plan requires a lower contribution from the State and greater contributions from Milwaukee based entities. The “Jock Tax” exists under either plan. Under the new plan, the State is keeping a larger portion of the income tax (“Jock Tax”) collected by NBA players with those revenues being used for roads, education, social services and everything else funded by the general budget after the State’s portion of bond debt service is paid with these revenues. This is because the Milwaukee based entities are picking up a greater share of the public financing component in the revised plan. 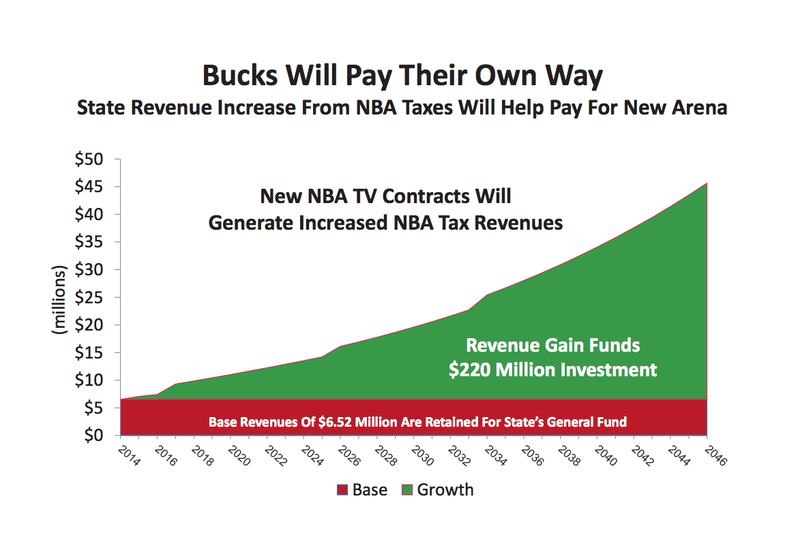 When Governor Walker introduced the original plan back in January, the primary reason he believed it to be a good deal for Wisconsin is because if the Bucks leave, the State will lose all the income tax revenue they ALREADY COLLECT under the existing “Jock Tax” from NBA players, estimated at $6.5 million per year in 2014 and expected to grow significantly in the future. Here is a graph that Walker used in his presentation in January that illustrates the tax revenues NBA players pay currently and are projected to pay to the State in the future. Focus on the red and green amounts in the graph above. The red represents the amount of money the State collected from NBA players last year. The green represents the additional revenue the State projects to collect from NBA players over the next thirty-years. As Governor Walker stated, due to the new TV contract the league signed last fall, the State is in line to start collecting $10 million per year starting in 2016-2017 with that number growing further in subsequent years. Now, how much would it cost to pay debt service on State issued bonds for a new arena with the new financing plan? Let’s assume that the State issues bonds and sells them to the Public Land Trust under these scenarios. We aren’t showing any of the “out-years” where the State is still paying a fixed amount on the bonds but is now pulling into the State’s general fund $10 to $20 million dollars in annual surplus tax revenues even after netting out the bond debt service. So over the next decade, the State is not only retaining the money it currently takes in from NBA players for general budget purposes but covering the primary bond debt service. Further, since the bonding amounts are so much lower than the prior plan where the State covered everything, the State should now make a nice surplus over and above these baselines. The “Jock Tax” is already in place and last year collected $6.5 million from NBA players. The vast majority of the NBA player salaries that are taxed by Wisconsin are funded with national and international NBA revenues and not revenues generated locally here, so this economic activity and income tax revenue won’t be “replaced” if the Bucks leave. Take another look at the Walker chart above that projects the annual NBA player income tax the State will collect in the years ahead. Hundreds of Millions of Dollars. If the Bucks leave, that’s all gone. To Seattle and Washington State. Please send this link onto family and friends. It is important that Bucks fans and arena supporters understand the math and why many view a new arena project as an economic winner for the State before we even get into the other benefits provided.